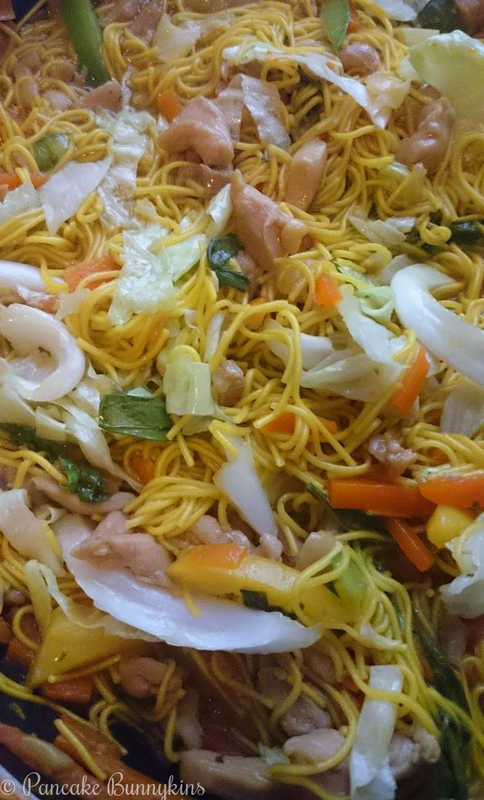 Pancit is famous in the Philippines during birthdays and special occasions. For Filipinos, it symbolizes long life. The noodles used are introduced by the Chinese and was later adopted in the Filipino cuisine. There are varieties of pancit made in the Philippines depending on the type of noodles and ingredients used. Pancit could be in a fried, stew or soup form. I used chicken meat instead of pork in this version. 1. Saute the garlic and onion once oil is hot. 2. Add the chicken fillet, cook for 5 minutes. 3. Pour in the soy sauce and oyster sauce, stir. 4. Add the water and crush the chicken cubes. Let boil. Simmer for 25 minutes or until chicken is tender. 5. Sprinkle salt, pepper and parsley. 6. Add the carrots. Cook for 8 minutes. 7. Put in the flour noodles. Allow the noodles to absorb the water. 8. Mix the green bell pepper and cabbage. Stir. Cook for 2 minutes. 9. Transfer to a serving plate. ***Most Filipinos add shrimps and sausages to enhance the taste. ***You can also add other vegetables like snow peas, red bell pepper or bok choy. That sounds delicious. I love learning about different cuisines. Thank you. 😀 It’s really good especially if my mom makes it.